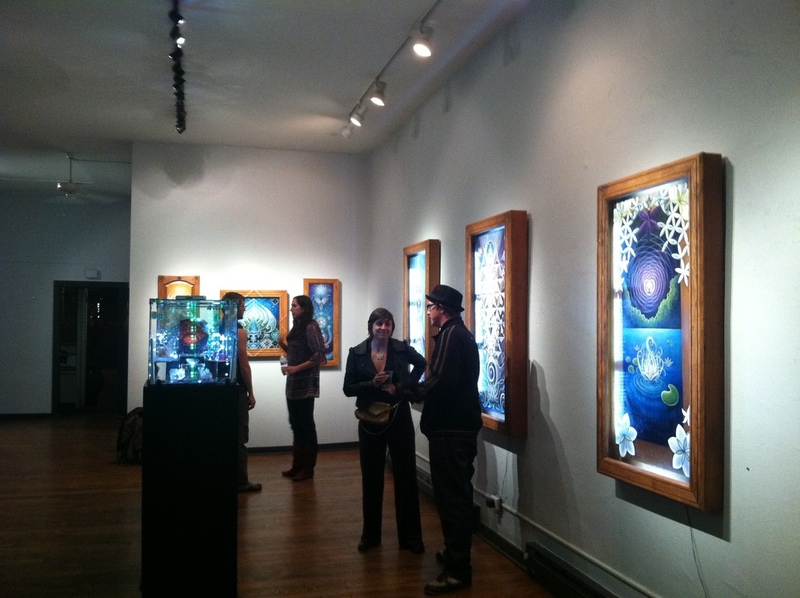 I recently exhibited my artwork at the Knew Conscious gallery in Denver, CO. I showcased nearly a decade's evolution of my artwork from my very first sacred geometric "Seed" to the many facets of my crystal vision. With incredible support from my dear friends and artist Victor Tilvaro, we built gorgeous wooden frames out of reSourced materials, including lightboxes for my most significant works. The show also featured a stunning crystal collection by Naomi Hinds. Victor and I also collaborated on a multi*dimensional portal called "20:13" inspired by the Mayan Dreamspell Calendar. At the center of the piece is a "cosmic" lens or an "Eye of Time" that allows the viewer to gaze deeper into the heart of Creation. If you are in the Colorado area, keep your eye out for more upcoming shows at Knew Conscious! They've paved a solid foundation for the visionary arts in Colorado, hosting an epic spectrum of past artists including Martina Hoffmann, Andrew Jones, Amanda Sage, Kris Davidson, Adam Scott Miller, Xavi and more...!